At shows I hear so many misconceptions about air plants- most notably that they can live off the air alone. One of my customers was even told by a shop owner that you don’t need to water them, and that they only live a couple months. This is a complete misconception! With the proper care, your air plants will prosper, slowly growing larger. Very happy air plants will even produce small ‘pups’ or baby off shoots, and with luck, flower. I thought I would share my method for air plants care- water baths. It keeps my plants happy, many of which have been in my collection for several years now. 1) Fill a bowl with water. I don’t want to shock my plants, so if the water is very cold I wait for it to become a very luke warm on the colder side. 2) Put your plant in the bath! Give them about 15 min in the water. 3) Heres the secret to the water bath- your plants need to dry upside down. This way, water does not seep into the plant and cause it to rot from the inside out. Give them a little shake to get excess water off, and I find they dry well on my dish rack. I leave them like this for a couple hours, you can tell when there dry because they will get slightly fuzzy and super refreshed looking. 4) When dry- put them back on display. I keep my air plants where they will get a lot of bright indirect light. Play around with where you keep them if you notice they are getting too dry, and browing at the tips, you may need to place them a bit further from a window, or in a place that is not quite as bright. 5) Bonus info- you can purchase air plant fertilizer- a little bag will last years. This way you can ensure that the plant will be getting nutrients which It may normally have gotten in it’s environment on other plants and trees. Enjoy your air plant garden! They are such sweet little beings, each with a different personality. Before I was able to do pottery full time, in fact just as my ceramics practice was beginning to build some economic agency in my life, I was a bartender. I still work a couple days a week in a restaurant to supplement my income as a server ( I start my studio days too early to tend bar for those 3am nights anymore, waitressing hours are little bit more reasonable for me!). Many of my earliest supporters were (and still are) past co workers - who bought from me and encouraged my work as a potter- I love my restaurant family! I don’t miss the late nights, but there are parts of cocktail culture that I do miss, like the camaraderie of working with a solid team, and the energy of pouring cocktails for a full house on a busy night. As a bartender, I was also drawn to learning the history of cocktails and classic recipes, which led to a fascination for creating new cocktails. It was inspiring having access to literally hundreds of liquors and cordials- flavors at your fingertips. I still have a lot of this information lodged in my head. For the perfect blended scotch that floats a drink with a hint of smoke: Monkey Shoulder. For a hint of spice in a margarita, I reach for the green bottle that is infused with the freshness of a just picked poblano pepper: Ancho Reyes Verde. At home I prefer simple cocktails that don’t require a grocery list of ingredients. This mulled holiday spiced cherry wine fits the bill, and then some! I love this recipe because it tastes complex and delicious- as if it took hours of simmering spices on the stove- but truly the hardest part is making a sugar simple syrup. This recipe can go from zero to steaming mug of mulled wine in about 10 mins. The trick is three flavor bomb ingredients, which do all the work of creating an aromatic spiced wine that is a little too easy to drink! Cherry wine gives a nice balance of tart and fruitiness, and the bartender trick lies in the St Elizabeth Allspice Dram, also known as a Pimento Dram. This liquor has roots in Jamaica. Basically, it is a rum base with a concentrated infusion of spices- clove, nutmeg, cinnamon and pepper. The result is a tart, juicy cherry wine infused with holiday spice. This has become a recipe I turn to around the holidays, because it’s festive and warm. I hope you enjoy this recipe from my years as a Chicago bartender- now a holiday tradition, enjoyed with loved ones. If you have a hot pot or induction burner, using it for this recipe can free up some space around the kitchen. Plus it’s easy to bring to a friend’s house! ** Note -I like to use my instant pot for this recipe BUT if using an instant pot DO NOT USE UNDER PRESSURE- alcohol and pressure DON’T MIX - it will explode- I leave the top off, and hit SAUTE function for 7 mins or until simmering. 2 Cherry Wine 750 ml bottle (I like Lynfred (IL) or Good Harbor (MI)- cherry wines are naturally a bit sweet, but try to choose a brand with some tart notes as well). If the Cherry wine is very sweet- you may not have to add any additional sugar. 1/2 Cup Simple Syrup (to make mix equal parts white sugar and boiling water, stir until dissolved). (or to taste). This recipe is flexible- If you are having trouble finding cherry wine, you may add a cherry kirsch liquor with a robust cabernet or a silky pinot noir base. Recipe makes about 8 servings (8oz portions). Combine all ingredients in a sauce pan or hot pot (if using hot pot - use saute function ONLY- do not cover and do not EVER use pressure to cook alcohol). Add all-spice berries if using. Bring to simmer, and serve immediately (Twinette Poterie wine cups work exceptionally well!). May be garnished with orange peel or luxardo cherries. May be stored for a week in the fridge. Enjoy & Best Holiday Wishes to you & yours! One of the greatest gifts of ceramics work is the unpredictable. I say that with a grimace and sarcastic tone- even though I know it's true. Because glazes pre-firings don't reflect the post fired colors, for example, my lime green stain is black before firing - which can make it difficult to know how much to apply- glaze game is hard, but full of surprises. Different glazes in new combinations will create effects that I never would have thought of on my own. Outlier results can change the whole course of my work, as when I started to notice that excessive layering of our studio nutmeg glaze created a lovely 'frosting' effect on my pie plates. Or when our studio pond scum glaze was on a piece near my vases, and fumed on my work in the kiln, creating striking blushes of pink on my pots. Some of these results are desirable and re-creatable, some are more complicated. But this is not a story about those happy times, and when things go wrong, that can be a hard pill to swallow! Today in the kiln unloading I was excited, I had 9 mugs which I had spent 3 hours EACH on decoration alone. But one after the other **ISSUES**. 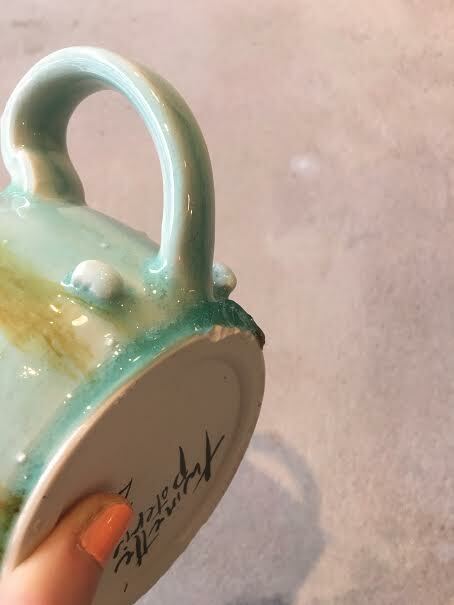 Glaze dripping onto the shelf, and snapping off the piece leaving sharp glass. Colors running too much and images on the mugs smudged and covered up. I even had a bottom crack off which hardly ever happens. I know this kiln fired a bit too hot. Of course there must also be some factors which I did not completely understand or account for. The next time I make this design, I am hopeful that I will better be able to translate the visual image in my head to clay. I also sometimes put away pieces where colors were not perfect, and later realize that the piece not meeting all my expectations does not make it completely faulty, just different. If you are a potter reading this, then I am sure this is a familiar rant. All the same thanks for reading. I feel a little better... I always tell myself, if pottery guarenteed perfect results every time- there would be no learning, and where is the fun in that? Pate Chinois!! That was the answer whenever we were visiting my Grandmother in St-Gregoire, the small (*small*) town about two hours north of Montreal, Quebec. 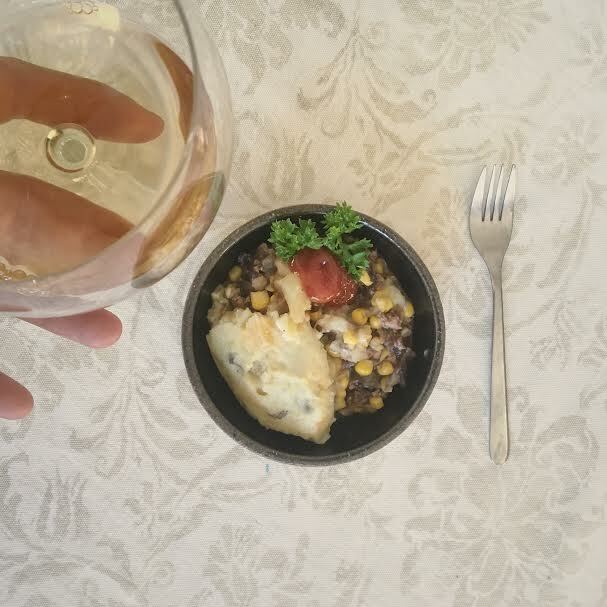 This French Canadian rendition of Shepard's Pie is supposedly named so as a dish Chinese cooks made for the rail workers during the building of the North American railroads in the late 19th century. The question was , qu'est-ce que vous voulez pour souper? Or what do you want for dinner. This was my absolut fav, a combination of silky potato pillows over sweet corn, and rich buttery ground beef- served with ketchup. This is one of my fondest food memories. As an adult, I have adopted a diet with less meat. This revised recipe is savory- a touch of miso paired with mushroom and walnut gives the tofu that craveable umami I am looking for in the ground beef component. Don't be scared by the long ingredient list, this recipe is adjustable to what you have in your pantry- if you don't have red wine vinegar, use what you have on hand, if you don't have liquid smoke (it's a wonderful pantry item I recommend buying) but just omit it. *Twist - add boiled or steamed turnip or cauliflower to the mashed potatoes for extra veggie points! 1. Preheat oven to 400 F. Drain, rinse and press tofu to remove excess water so it can better absorb flavors. I usually sandwich the tofu between two plates, and set a heavy cast iron for weight on top for about 15 mins. 2. Set a pot of salted water & boil potatoes. 3. Saute onion in 1/2 a tbsp butter over medium heat until softened (5 mins), add garlic for a few more minutes, and then the mushrooms & spices. Drizzle with olive oil if pan is getting dry. Saute for 10 min, stirring occasionally. Once mushroom is browning around the edges, crumble in tofu. Your going for a ground beef texture. 4. Add a couple of splashes of white wine to deglaze pan, and a tablespoon of miso, the red wine and the liquid smoke, allow to cook for 10 mins. 5. Add walnuts, and fresh parsley, remove from heat. 6. Prepare whipped potato- I prefer to leave the peels of the potatoes on if I am using organic for extra nutrition. If organic is not available, I peel potatoes after boiling (instead of before), because it's easier! Mash potatoes with milk, whipped cream, and remaining tablespoon of butter. Salt and Pepper to taste. 7. In a separate bowl, mix creamed corn and kernel corn. 8. 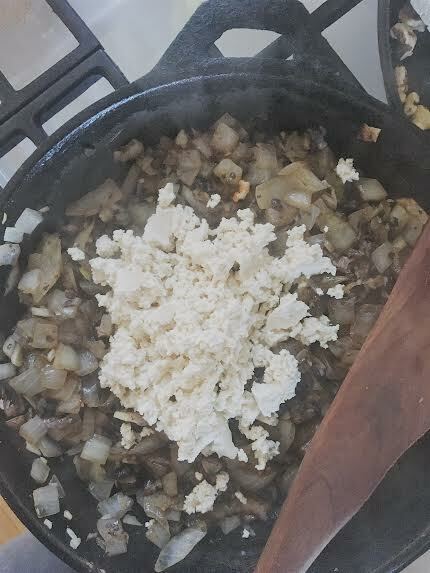 Assemble the components- the tofu mixture on bottom, followed by corn layer, and top with the mashed potatoes, using a spatula or large spoon to smooth out the top. 9. Pop in the oven for 25 min, or until it is bubbling and the top is browning. Serve Warm, with ketchup if your me, and the remaining wine! This recipe is from my grandmother Antoinette (from whom my pottery business memorializes - with her nickname, 'twinette) and making this simple dessert using my ceramic cook/bakeware honors and celebrates her. Grandmama Antoinette was a woman with a hilariously sarcastic tongue, and a penchant for pushing buttons- she may not have been the most outwardly emotive person, but one way she showed us she loved us was through her cooking. She never presented her grandchildren with less than 3 dessert options after a meal. Often the spread included fresh baked pies perfect for showcasing the summery goodness of fresh fruit- but she also often had old timey favorites like tarte au sucre... yes that is sugar pie. Her clafoutis recipe is one that my mother brought into our home which I grew up eating. This is probably because my mom is a health nut- and much of the sugar in this recipe comes from natural sources: fresh fruit. If you find yourself craving this bubbly jammy goodness in the winter, it can also be made using frozen berries, but expect longer bake time. You know summer is right around the corner when pints of strawberries are going for 99 cents a pound at the grocery store! Growing up, my mother always called this clafoutis, but when I had my mom dig up grandmama's recipe, it was under a different name, pate a poutine. Go figure. Classically french style clafoutis are more custardy and often use almond flour. This recipe is a bit more utilitarian, in that most people probably already have an egg, flour and milk in the pantry. This style clafoutis is also more cake like. For those of you who aren't familiar with this dessert, it features piles of fresh fruit which are baked with a cakey blanket covering the top. 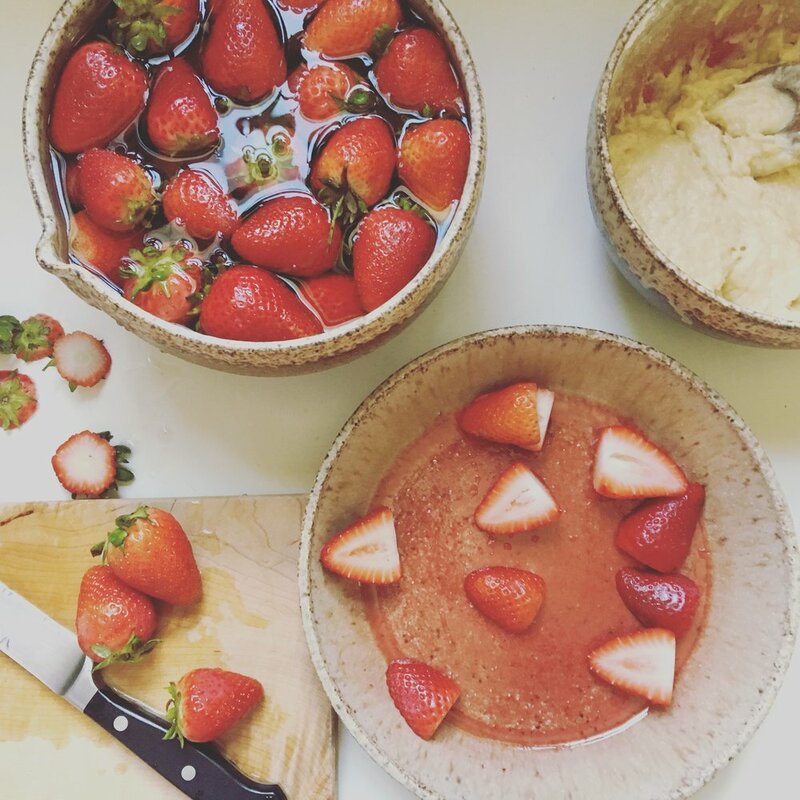 1) Soak strawberries in water- if your not using organic , soaking for 30 mins is the most effective to remove pesticides (thanks to chef Luke Creagan for the tip!). 2) Preheat oven to 350 F. Mix dry and wet separately- so whisk egg, then mix in milk. 3) In another bowl, cream sugar and butter to combine, then add flour, baking soda, and salt. 4) Incorporate wet and dry ingredients, the batter will be a fairly dry and thick. Stir until just combined. 5) Heap halved berries into a pie dish. I used 2 pints of strawberries. Depending on sweetness of your berries, you can sprinkle sugar on top. I squeezed half a lemon over the top of the fruit, for a boost of brightness. 6) Spread the batter over top the berries. It's ok if it does not completely cover. I like the berries peeking through the batter in the end! 7) Bake until golden 30-55 mins. Insert toothpick, when clean its done! 8) Cool a bit and serve! Clafoutis can be enjoyed with ice cream, whipped cream, but also excellent warm and stand alone, Bon Appetite, Merci Grandmama Bouvet!